The second day my husband and I were in Barcelona, we wandered around in a haze of exhaustion and jetlag (and maybe also sangria). At one point we ended up at the end of La Rambla. I sat and rested for a bit while the Mister wandered to see where exactly we were. As I sat people watching, I noticed a very ornate fountain. At first I thought it was a street urinal. I really did. I mean, I don’t know. They had these things in Amsterdam and men just pee in the street in Paris, so why not have a fancy urinal in the middle of La Rambla? As this thought was going through my head, imagine my surprise (horror?) when I saw someone walk up to it and drink from it. At this point, in my exhausted state, I didn’t know what to think. So I just put the whole thing in the back of my mind and suspended my disbelief. The next day saw us back on La Rambla, this time with a Rick Steves tour book in hand. This is when I learned that this ornate “urinal” is actually a very famous fountain. This is the Font de Canaletes. Everything started to make sense. 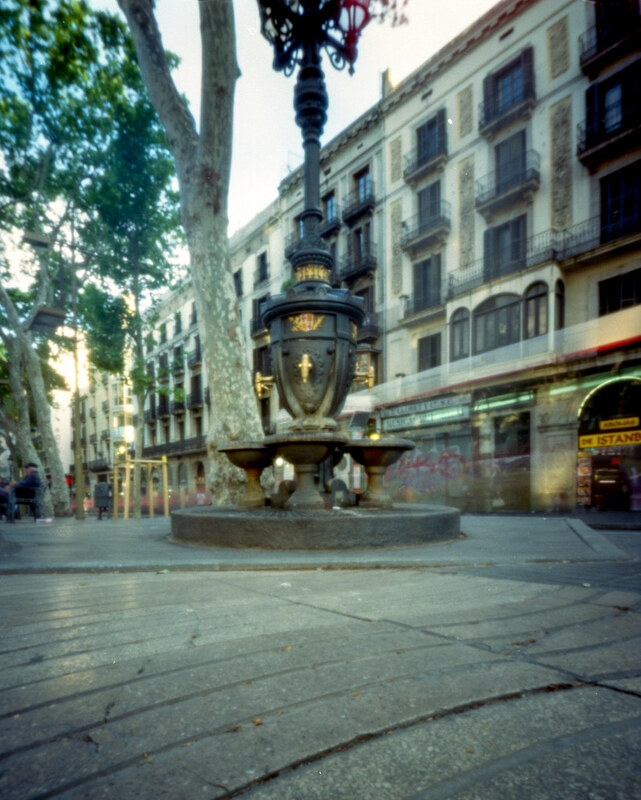 The fountain dates back to the 19th century and legend has it that people who drink from it will come back to Barcelona. Indeed, I did this very thing. I hope the legend is true. This photo was made with a Terrapin Bijou and Ektar 100. Exposure time was around 30(ish) seconds.